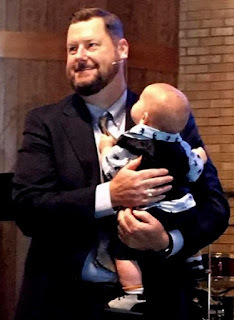 Last Sunday we baptized Edward Grady Meyers, son of Sarah and Matt. Edward was locked in the whole time, as you can see from the photo above! 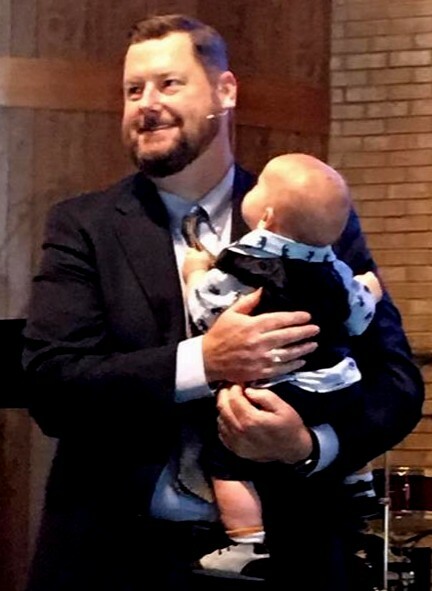 Baptizing babies is a core belief of United Methodists. Do you know why? It has to do with grace. We believe God's love is active within us from birth. God is continually guiding us into relationship. Once we commit to Christ, God's grace doesn't stop; we are continually being shaped from the inside out by love. Babies participate in that love too! 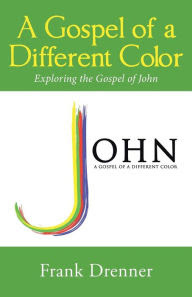 Baptism has nothing to do with understanding or accepting grace; it has everything to do with responding to the grace already active within us. Matt and Sarah reaffirmed their faith in Christ at Edward's baptism. They also committed to "nurture him in Christ's holy church, that by your example he may be guided to accept God's grace for himself..." Then the congregation also commits to Edward: "We will surround this child with a community of love and forgiveness, that he may grow in his service to others." We fulfill those commitments through Sunday school, Vacation Bible school, sending kids to church camp, Trunk or Treat, and so many other ways. Grace UMC loves kids. It's obvious. And they love being here. I'm proud of that. You get the idea. We laughed and had fun together. I can't wait to go back next week. The baptismal commitments I mentioned above are made by parents and congregation every time a child is baptized. It's a beautiful thing. This morning I am thinking: "Who said those commitments are limited to the kids in the church?" Aren't we living out our commitments to kids everywhere we show them God's love? We also say this: "With God's help we will proclaim the good news and live according to the example of Christ." How have we lived that notion out specifically to kids recently? Like this week? If you can't answer the question, I encourage you to seek ways to serve kids. Contact Christy about serving at Wakefield: drennerchristy@yahoo.com. They need readers and mentors. Decorate your trunks for Trunk or Treat October 29. Make it a point to welcome children on Sundays, even if-- especially if-- they're being loud and silly in the back of the Celebration Center. I get that worship is a serious thing, but it's also joyful, and a little bit of fun never hurt anyone. Edward had a blast last Sunday. Let's all do whatever we can to spread Christ's joy to the littlest ones among us-- inside and outside the church.